This book covers all aspects of physical vapor deposition (PVD) process technology from the characterizing and preparing the substrate material, through deposition processing and film characterization, to post-deposition processing. The emphasis of the book is on the aspects of the process flow that are critical to economical deposition of films that can meet the required performance specifications. The book covers subjects seldom treated in the literature: substrate characterization, adhesion, cleaning and the processing. 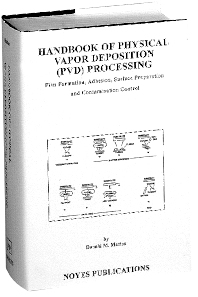 The book also covers the widely discussed subjects of vacuum technology and the fundamentals of individual deposition processes. However, the author uniquely relates these topics to the practical issues that arise in PVD processing, such as contamination control and film growth effects, which are also rarely discussed in the literature. In bringing these subjects together in one book, the reader can understand the interrelationship between various aspects of the film deposition processing and the resulting film properties. The author draws upon his long experience with developing PVD processes and troubleshooting the processes in the manufacturing environment, to provide useful hints for not only avoiding problems, but also for solving problems when they arise. He uses actual experiences, called ""war stories"", to emphasize certain points. Special formatting of the text allows a reader who is already knowledgeable in the subject to scan through a section and find discussions that are of particular interest. The author has tried to make the subject index as useful as possible so that the reader can rapidly go to sections of particular interest. Extensive references allow the reader to pursue subjects in greater detail if desired. The book is intended to be both an introduction for those who are new to the field and a valuable resource to those already in the field. The discussion of transferring technology between R&D and manufacturing provided in Appendix 1, will be of special interest to the manager or engineer responsible for moving a PVD product and process from R&D into production. Appendix 2 has an extensive listing of periodical publications and professional societies that relate to PVD processing. The extensive Glossary of Terms and Acronyms provided in Appendix 3 will be of particular use to students and to those not fully conversant with the terminology of PVD processing or with the English language. Engineers, including surface engineering personnel, technicians, and other plant personnel in process industries such as semiconductors and microelectronics. Especially informative for those new to the field. Donald M. Mattox obtained his B.S degree in Physics from Eastern Kentucky State University. He served as a meteorologist and Air Weather Officer in the USAF during and after the Korean War. He then obtained a M.S. degree in Solid State Physics from the University of Kentucky in 1960. In 1961 he went to work at Sandia National Laboratories (SNL). Don was a manager and member of the Technical staff at SNL for 27 years and has been a consultant to the vacuum coating industry for over 28 years. In 1995 he was the recipient of the American Vacuum Society Albert Nerken Award "For his invention of the ion plating process and its continued development." In 2007 Don received the Society of Vacuum Coaters Nathaniel Sugerman Award “For his development of the ion plating process and long-term commitment to education in the vacuum coating community.” Don has published numerous papers and book chapters on the subject of Physical Vapor Deposition (PVD) processing and technology transfer from R&D to production. He is the author of Handbook of Physical Vapor Deposition (PVD) Processing (1st edition 1998, 2nd edition 2010) published by Elsevier and Foundations of Vacuum Coating Technology, published by William Andrew/Elsevier (1st edition 2003). President, American Vacuum Society (AVS) 1985; Technical Director, Society of Vacuum Coaters (SVC) 1992-2007; SVC Technical Editor 1988–2016; Consultant, educator and co-owner of Management Plus, Inc. 1984 – present time.